Black and Tan Coonhounds are well known for their easy going demeanors and make exceptional house pets. They are fantastic for hunting raccoons and make being a watchdog appear effortless. Black and Tans are playful and blend easily with children as well as other pets residing in the home. They are a stubborn breed at times and do have a tendency to bark on occasion. What makes them so rare is their ability to be great scent dogs with noses at ground level and still trot at a rapid pace seamlessly. Independent and can tend to stand off against strangers entering their home, the Black and Tan breed is strong at first glance, but can be very loving and affectionate. Fantastic runners, the Black and Tan Coonhounds are natural athletes. They certainly have a gift for detecting scents, so do ensure you are walking these canines on a leash at all times to not encourage them to run off. Coonhounds are heavy on the drooling at times, and they do have a deep bark to them as well. Having their ears monitored for health issues is a necessity for any Black and Tan Coonhound owner to keep up with. They are simple to groom with very little attention needed to their silky coats. 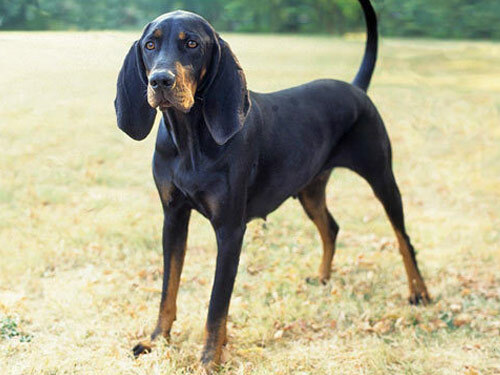 CHD is the most common health issue for any Black and Tan Coonhound. This is a condition where the hip joint can become lose or unstable in the canine, making it a challenge to run or even walk as they once did as a younger pup. Having an overactive thyroid gland is also common along with ectropion. The only testing this breed may require is for their hips, thyroid and their eyesight should those become an issue as they age. Black and Tans live a common canine lifespan of ten to twelve years. They can adapt to residing in cold or warm climates and make great protectors of their domain. Generally weighing around between fifty and seventy-five pounds, they are larger dogs and not suitable for living in a small apartment situation. Created by the Foxhound and Bloodhound family, the Black and Tan Coonhound is an American tradition. Making their mark in the early 1700’s, they have become to earn a reputation for being exceptional scent hounds and masters at hunting raccoons. They used to hunt bears as well while roaming the rough terrain of the Smokey and Appalachian mountains. Black and Tans are useful for hunting at night when visibility is low for other dogs, they excel. Earning their AKC nod in 1945, they went on to have great success as a show dog and as a household pet. Something unique that the Black and Tan Coonhounds are capable of participating in is the annual evening hunting adventures held by the United Kennel Clubs. This night time hunting competition is very popular and this breed is a favored winner. Their protective fur coats keep them comfortable in any temperature which is a desirable trait for a hunting breed such as the Black and Tan Coonhounds are utilized as.